Drone deliveries of pizza 🍕 are now a reality, with the first commercial delivery of food by drone to a customer, anywhere in the world, successfully completed in New Zealand this morning. Domino’s Pizza Enterprises Limited (Domino’s) and drone delivery partner Flirtey delivered the first order, a Peri-Peri Chicken Pizza, and a Chicken and Cranberry Pizza to a customer in Whangaparaoa, 25km north of Auckland. The unmanned aerial vehicle, DRU Drone by Flirtey, was autonomously controlled using GPS navigation, overseen by a team of drone experts and a qualified and experienced drone pilot. 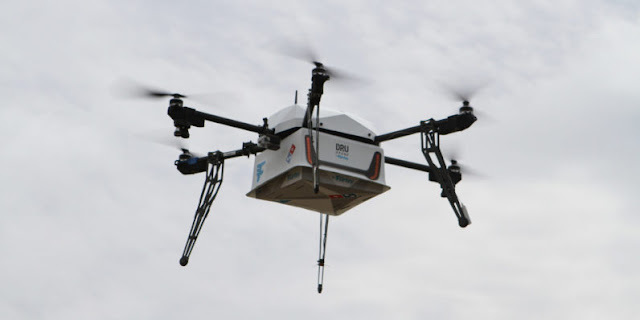 Domino’s Group CEO and Managing Director, Don Meij, said the successful DRU Drone by Flirtey delivery came just three months after the companies announced their partnership, but followed a number of operational and product trials, including food temperature testing, and liaison with government.